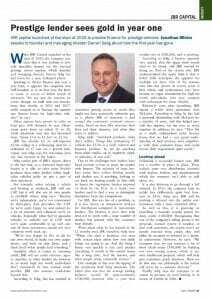 JBR Capital and its Managing Director, Darren Selig, got a very full profile recently in the motor finance trade’s own magazine, Motor Finance. Appearing in the publication’s April 2016 issue, the interview touched on the origins and history of JBR Capital, but focused particularly on the company’s personal, flexible system of assessing and scoring customers’ creditworthiness, and their willingness to put together finance packages that are beyond the capabilities of other firms. Read more of the interview below (click for a full-size PDF version) – and if it raises any questions or inspires any ideas, please feel free to get in touch with JBR on 020 3355 0035.